Wild Touch® is Europe’s most comprehensive custom manufacturer of exclusive high quality handcrafted accessories made from gameskin. Our headoffice and handling facilities of orders / receiving of gamehides are are located in Trige close to Aarhus in Denmark. With a Wild Touch® product you make a personal statement which stands out from the ordinary with beauty and character. 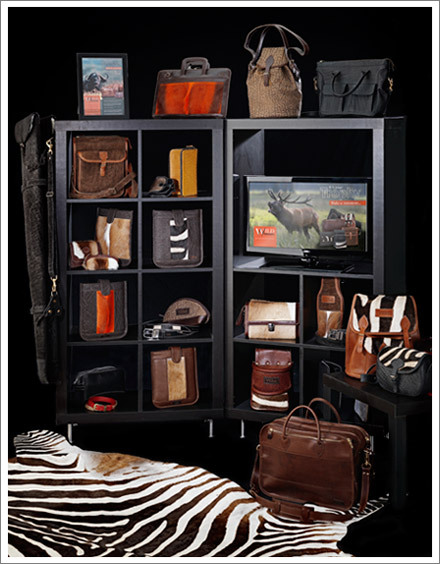 Endless product and design possibilities for your personal wildlife leather and fur accessories. Unique handmade quality products are not cheap – but you will be surprised how much value you will get for your money. Our prices starts as low as 70 € + VAT and our most expensive product is a shotgun case for a pair of shotguns made in African elephant leather, is not more than 1.400 € + VAT. Unique timeless craftsmanship in combination with the best materials designed in denmark - made in EU. We develop and design all our products in Denmark and the physical processing of the products takes place in the EU. We use only the best materials. For example, all zips custom made for us by the world's biggest and best producers. Our edge reinforcements and contrast leather is vegetable tanned Italian leather of the highest available quality. D-rings, snap hooks, are mostly made of solid brass. Some of our products are however made in other alloys. But always of the highest quality. All hide are tanned by artisanal principles and traditions by professional tanneries in EU and Africa. We tan both for leather and fur (fur = with the hair on the outside). The tanning process is mostly vegetable tanning. We use chrome tanning when required (eg. Elephant, Hippo, Crocodile). We only process legal game hides. If the game hide is subject to to CITES regulations (we always demands CITES certificate if your game species are under the CITES convention. We accept NO game skins on the CITES list if it not followed by enclosed documents. We dyed leather (and also some fur) in a variety of standard colors - see more on our standard colors here. In addition, we can agreed dye in special colors.